I actually took dozens of pictures of this interesting ruin, which is often called the 'Pharaoh's Bedstead", since it looks like an enormous tester bed. It was built in 167 CE. 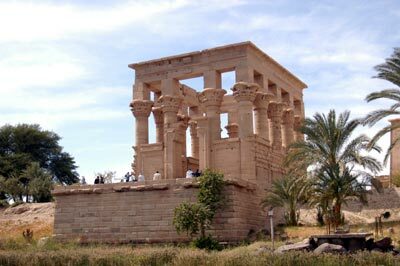 It stands to the east of the Temple of Isis. 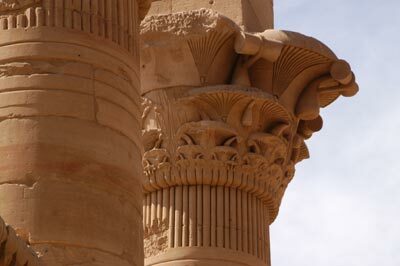 There are fourteen columns with elaborate capitals, and spaces between intended to hold sun disks. Because only two walls have been decorated, it is assumed that the kiosk was never finished. 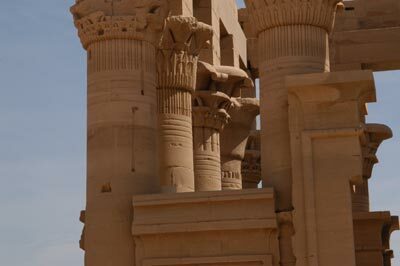 The decorations that do exist are the standard ones -- Trajan, the king, offering to Horus, Osiris and Isis.